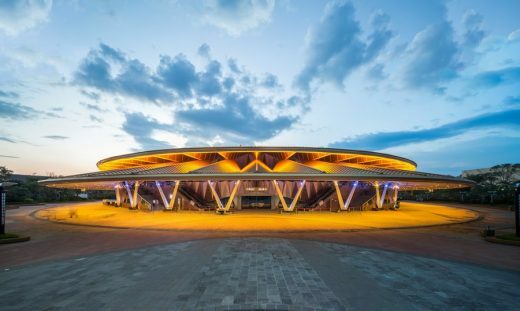 Stufish Entertainment Architects has completed the design for the bespoke 1,183 seat Dai Show Theatre in Xishuangbanna, China, for the country’s largest property developer, the Dalian Wanda Group. The theatre will host a permanent 75-minute acrobatic water spectacle created by show producers Dragone. Stufish has also designed the entire stage and set for the show, becoming the first practice ever to deliver all architectural and show elements for a theatre. 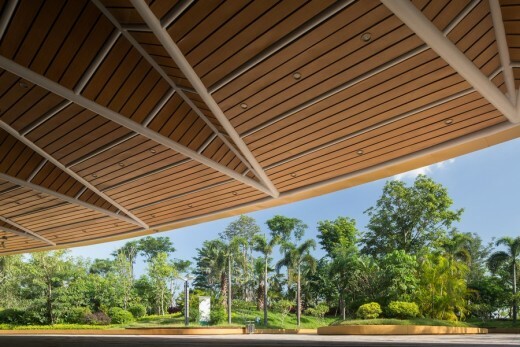 Designing the entire project allowed Stufish to present a holistic architectural language throughout, from the canopy-inspired roof to purpose-built stage elements. 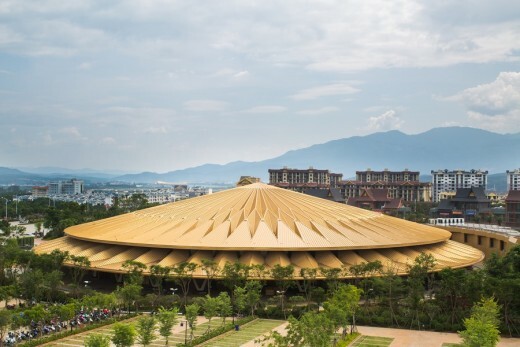 The 19,500sqm Dai Show Theatre is a key element to Xishuangbanna’s newest cultural offering, the Wanda Xishuangbanna International Resort. In addition to the theatre, the resort includes apartments, shopping malls, bars and restaurants, hotels, golf course and a theme park. 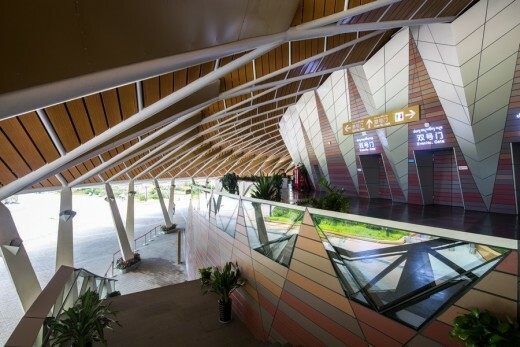 It is set to become a major tourist destination for both Chinese and international visitors. 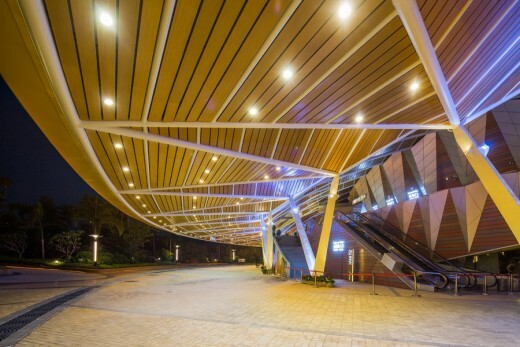 Nature’s influence on the design is particularly expressed in the 110m diameter golden roof, which has a structure that evokes the folding nature of palm fronds. The roof has two tiers that act as a canopy for the open-air lobby below, and is supported by tree-like columns that encircle the theatre. 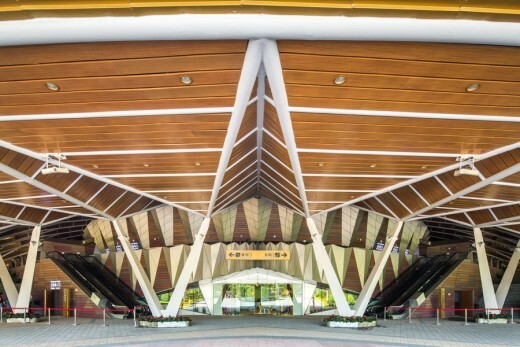 Where the two roof tiers join, openings between the structural points allow for natural ventilation on the mezzanine lobby, in response to Xishuangbanna’s warm climate. The openings also allow visitors to look out at surrounding views. 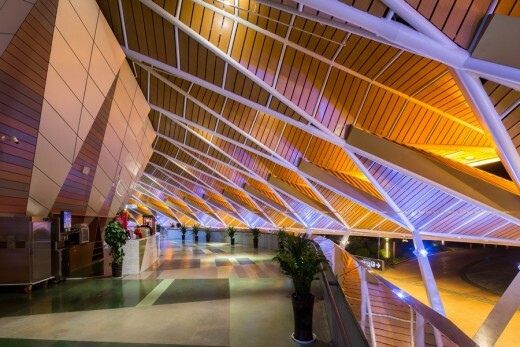 Stufish’s organic design materialises inside the theatre as well. 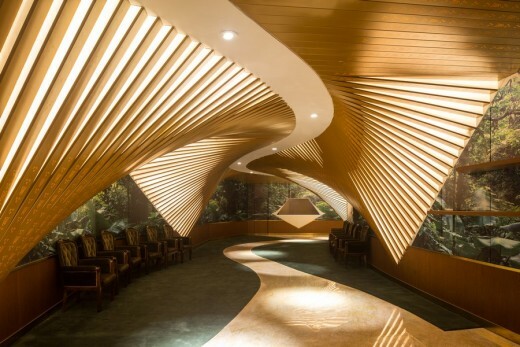 Long textured “leaves” form golden walls that twist up into the ceiling, creating an intimate, low-lit atmosphere in the VIP areas. The repetitive folding patterns carry throughout the space, into exclusive suites, at times transforming into radial embossed chandeliers. 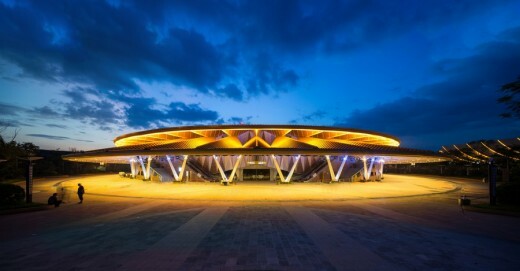 In the auditorium, the audience is seated in the round, surrounding a 1,400sqm stage that is split into three sections. The main central stage has a 14m-wide performance basin containing an 8m wide pool plug which lowers down 5.5m to allow for a dramatic 15m high-dive off the catwalk above. When closed the plug lays even with the performance area’s acrobatic flooring. Adjacent is the forestage, which, along with the central stage, can be either wet or dry. The final performance area is a dry upstage section used symbolically to convey a vast infinity and for more practical purposes, such as storing and transporting scenery. The stage has been designed so water can flood the areas separately and fill the entire performance basin in 45 seconds and then be drained in just 20 seconds. “Combining our roles of architect and set designer allowed us to utilise our in depth knowledge of the theatre space and ensure the design of the scenery blended coherently into the architectural concept,” architect for the show Alicia Tkacz states.